Using OrangeHRM’s Time and Attendance Management, timesheets, attendance, task and project management can be easily tracked, creating time to focus on strategic priorities. The Time and Attendance module helps organizations make strategic decisions based on accurately reported data. The level of detail in our time sheets is second to none. So whether your need is basic or complex, OrangeHRM has you covered. You can quickly and easily create reports and overviews, and increase your HR capabilities without the need to increase staff or your budget. The module also allows you to receive email alerts based on timesheets, so you no longer need to chase employees who forget to submit. (✔) Track time data in summary or in detail. Just durations or with precise starting and ending times. (✔) Track time data project and activity wise, solely activity wise or just in/out times with breaks. (✔) Support for weekly, bi-weekly, or monthly timesheet periods. (✔) Track time data for both exempt and non-exempt employees. 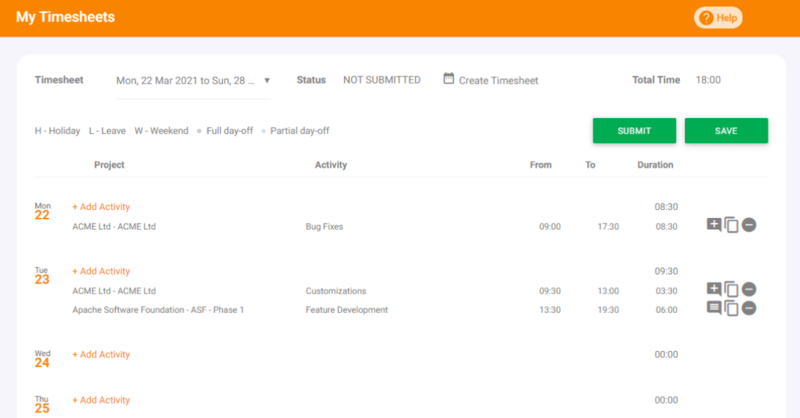 (✔) See leave and holidays within the timesheet. (✔) Copy data from a previous timesheet for fast data entry. (✔) Support for daily overtime pay rule, including support for double time. Maintain daily thresholds for overtime. (✔) Support for weekly overtime pay rule. Maintain the weekly threshold for overtime. (✔) Seventh consecutive workday overtime pay rule, including support for double time. Maintain the overtime threshold. (✔) Maintain pay policies which are collections of pay rules, employment status and location-wise. (✔) Define each pay policy based on regulatory or internal requirements. For instance, maintain weekly overtime threshold as 40 hours for U.S. pay policy and 38 hours for Oceania pay policy. (✔) Configure different pay codes, for each overtime type. (✔) Generate pay hours report to export pay code wise employee work hours for payroll. (✔) Online web based punch-in/out. (✔) Android and iOS Apps based punch-in/out. (✔) Current time enforcement, IP based restrictions. (✔) Add notes with the attendance record. To indicate the site or the job. (✔) Support for multi time zones. (✔) Supervisors may add or alter attendance data.